Hey there! 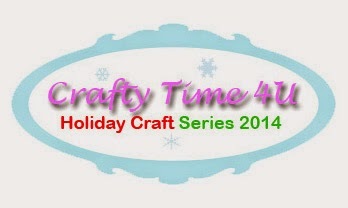 welcome to day 11 of my holiday craft series. I love traveling and going places, but I am so glad to be back home! I was exhausted! my flights were one after the other, and I have no time to eat or to do anything. I hope you checked out yesterday's post because I anounced the winners of my giveaway. The post came out late, so sorry about that! I had a good time during my trip to Orlando, but like any other trip I have mishaps, such as the the damage of my phone (that's a terrible one). The good part is I came back, full of new inspiration. If you looking for inspiration, Disney is definitely the place to go. Everything in Disney is colorful, happy, flawless, and beautiful! I will tell you more on future posts. For today's card I have one more card that I made using the "deck the halls" stamp set by Lawn Fawn, as I told you before, is a great stamp to build wreaths, trees, and other holiday decorations. Craft cardstok, white cardstock, mini boy die by Mama Elephant, falling snow stencil by SSS, white pigment ink, blending tool, red stickles (could use rhinestones), foam adhesive, stamp adhesive. Gorgeous! I LOVE the die cut from foil - sooooo pretty! Your wreath is just beautiful and I love the banners. My granddaughter just returned from a Thanksgiving trip to Disney. She had a great time, but was pretty worn out too! Sorry to hear about your phone - how on earth did that happen? Looking forward to seeing your Disney inspiration! OMG! my phone, I just bought it and not chance to get a new one for all this time, I am devastated. I dropped in water! Terrible! I used to do everything form my phone. good thing I still have the old one! Thanks Tanya!